This attractive small garden tree produces glossy, dark-green, oval foliage which turns glowing shades of yellow, orange and copper in the autumn. 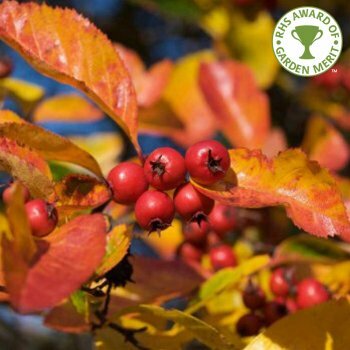 The small, white flowers that appear in May and the crimson berries which adorn the branches well into winter are popular with a variety of wildlife, such as honey bees, birds and squirrels - this is one of the best ornamental trees for wild fruits. This hardy Broad-leaved Cockspur Thorn tree will grow well in the very toughest positions, including coastal, exposed, damp and polluted sites, making it ideal for a difficult garden. Expect a height and spread of 5 x 4 metres in 20 years from the Crataegus Persimils tree, in a spreading, slightly rounded form. As with all Crataegus Trees, the branches are covered in thorns. This wonderful tree has the RHS Award of Garden Merit. Our pot grown Broad-leaved Cockspur Thorn trees can be planted at any time of the year. Start by removing weeds and grass within a metre of your desired planting hole. Dig a square hole as deep as your root mass and approximately 2x as wide. To help the tree establish more effectively, sprinkle root grow in the hole. You can prune Broad-leaved Cockspur Thorn trees in summer, after flowering, to help maintain a clear stem. By pruning the lower branches you will raise the crown, creating a more attractive form. If it requires any tidying up, this can be done in autumn. Remove and damaged or crossing branches and ensure there is enough light reaches the inner canopy.